Today we are going to take a look at another cheap Android tablet. The 7-inch 4G MID Google Android tablet costs around $80 and offers the usual performance that tablets in this price range show. This cheap tablet from iRulu has a IMAPX210 1GHz processor, 256MB of RAM and 4GB internal flash memory (MMC expandable up to 32GB). The display of the 4G MID Google Android tablet is nothing special and you can't expect anything different from a tablet with such price. It's a 7-inch screen and the resolution is 800x480. Connection options of this MID tablet include built-in WiFi adapter and a USB port. Manufacturer claims this one also supports 3G connection but we cannot comment on this one as we haven't test is. Multimedia features if this MID tablet include built in 1.3MP camera, stereo speakers and a headphone jack. As we mentioned this is an Android 2.3 tablet and as you probably already know there are hundreds of apps for this operating system but with only 256MB of RAM don't expect the smoothest experience. The dimensions of this iRulu MID Google Android 2.3 tablet are pretty reasonable and it weighs around 0.37kg which is more than acceptable. Why is it dat the battery always discharge whenever it is unpluge. This tablet has no manuel. Can u let me know how to get the sound on tablet? I have the same problem. whenever its unplugged the battery discharges, had it a couple of weeks and its basically useless, crashes all the time and has about 45 mins battery life when it was working. thanks i was just about to buy one of this tablets but i saw your comments and now i wont!!! He is not full of it. The yablet does not work properly. I would not continue buying more. They won't work.. They appear to be 'junk'! I bought one for my grandson. Battery would not stay working, but 6-8 minutes on a full charge. Could never get wifi. Second one I had to pay for , just didn't work after 20 minutes. NOTHING! Won't charge, won't turn on & the charger sparks. They're not good tablets. Started this treck through tablet hell in July 2013. Grandson still hasn't gotten to play with his gift & never will. I am going to check reviews on all tablets, before I spend more money on one. 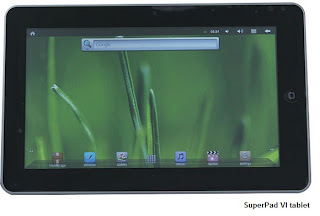 Thank you for your comment and feedback about the iRulu MID Google Android 2.3 tablet. When customers are active and share their impressions with specific product online(just like you did) it will be much easier to sort out what is worth buying and what is pice of junk. Thanks again and come back soon at our product review blog. I got the tablet for Christmas on dec 25. It stalled, and woud flip back to and forth like someone else was using it, finally after owning it a month, it froze to android screen and I cant find any way of fixing it.The soft reset does not even work. This is a useless waiste of money.